Federal Donuts announced Wednesday that it will raise money for Philadelphia's schools through proceeds from its latest creation: the Iggle Donut. As a handful of Eagles players and even the NFL have raised money for Philadelphia schools ahead of the Eagles' third Super Bowl appearance on Sunday, Federal Donuts just announced a school fundraiser of their own. The popular Philly chicken-and-doughnut eatery announced on Wednesday it had whipped up a new Super Bowl-themed creation for its fundraising efforts: the "Iggle Donut." 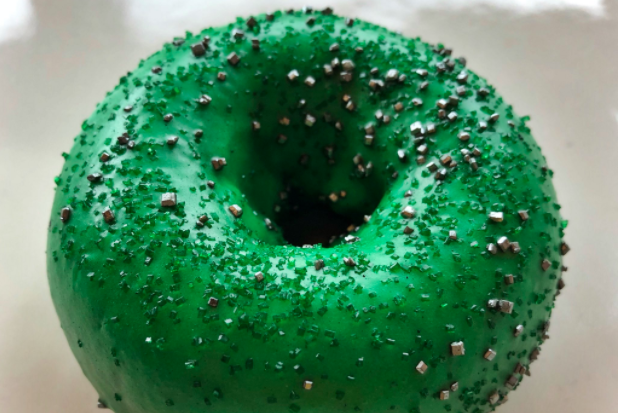 Its name taken from the Philadelphiaese word for the Eagles' name, the donut is glazed in kelly green and "sprinkled with Philadelphia grit and brotherly love," according to a tweet from the restaurant. Proceeds will benefit the School District of Philadelphia's fundraising arm, The Fund for the School District of Philadelphia. The public school district is set to benefit from a number of fundraising efforts that have come out of the Eagles' run to Super Bowl LII in Minneapolis. ReAnimator Coffee, which has locations in Fishtown and Kensington, started selling its limited-release "Foles-gers" coffee last week and said sales would be donated to the school district. On a larger scale, Eagles right tackle Lane Johnson began selling T-shirts on his website, after the Birds knocked off the Atlanta Falcons in the divisional round, that show himself and defensive end Chris Long wearing German shepherd masks in mockery of the Eagles' underdog status despite home-field advantage throughout the NFL playoffs. Newer shirts have since popped up for sale on the site to benefit the schools. Johnson also worked with Philadelphia-based Oldies.com to stock up on underdog masks ahead of the NFC Championship game, which ended in a 38-7 Eagles rout at Lincoln Financial Field, with 65 percent of those proceeds also benefitting the school district. Overall, those efforts had raised well over $100,000 as of last week. The NFL also announced last week that it would donate all sales from its own underdog Eagles shirts to the district, although Johnson and Long first called out the league on Twitter for its apparent marketing ploy before doing so. Federal Donuts has five locations open now in the Philly area. Its sixth location, at Citizens Bank Park, won't open again until baseball season opens in April.